Mornings are tough sometimes. Don’t get me wrong, I love my job…most of the time. But some days I’d like to stay in bed. It’s warmth is much more appealing than the drudgery of getting dressed, rushing out the door, and dealing with the attitudes and politics of work all day. This was one of those mornings. I just really didn’t want to go to work. I’d played several conversations that might take place over in my head. I’d chosen my comments, stressed over the likely responses, and decided what to say and not to say. I’d carefully picked out the right clothes so I’d look comfortable, but not sloppy. I’d done my hair and makeup. As usual, the entire time I was getting ready, I was giving my kids the checklist of questions we go through each morning. We were finally leaving the house and I turned the corner to exit my room. I wouldn’t call it a vision because that might be misleading. It was more of a “holy imagination”. 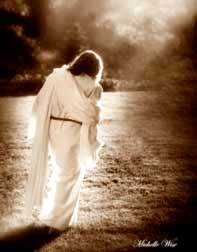 As I turned toward the door, I imagined Jesus leading the way, walking ahead of me. He turned to look back at me and said, “Let’s go!” It was milliseconds in length, yet I recall his flowing robe as He walked and the clap of his sandals on the floor. He was walking ahead of me, leading the way, as I started the day. I cannot express to you in words known by man the feeling of peace that gave me. The entire day became filled with hope. Jesus has told us to take up our cross daily and follow Him. For years I read this verse and I assumed Jesus wanted me to follow Him because He desired my obedience. I thought of it as a command to do His will, a job, and another rule to follow. I look at this verse differently now. I know following Jesus daily is for my own benefit. He goes before me. He doesn’t walk beside me like a friend. He doesn’t say, “I’ve got your back”, and wait for something to go wrong so He can react. He walks ahead of me. As I pass through the day Jesus is going before me clearing the thorns and briars to make it easier for me to carry my cross. He knows our crosses. We each have one to carry. Every day the cross is different than the one before. Sometimes it’s lighter, and sometimes heavier. But each day there’s a cross to bear, and a path to tread. Can you name what’s hanging from your cross? Perhaps it’s a failing marriage, a rebellious child, or emotional scars of an abusive past. It may be an enemy in your workplace, or a job that’s stealing your joy. Is it your finances, your health, or the health of someone dear to your heart? Whatever it is, Jesus knows about it. He knows the obstacles you will face, and He has prepared an easier path. Let Him lead the way.